Nature Power Monocrystalline Solar Panels take the sun's energy and turns it into electric current. Each solar panel is rated by-Wattage at working-voltage, the higher the-Wattage the more power you will receive per hour and the quicker you can recharge 12-volt batteries. These solar panels are high efficiency 12-volt solar panels featuring sturdy aluminum frames and high transparency tempered glass tops. They have a scratch resistant and antireflective coating to help keep the solar panel in good shape for many years. They are rugged enough to be permanently mounted outdoors or even on mobile applications such as RVs and boats. The entire module is sealed against moisture. Designed for charging 12-volt batteries in off grid applications of any scale a solar charge controller is required to keep your batteries from being overcharged. Designed for use with Nature Power 8-Amp Solar Charge Controller or Nature Power 28-Amp Solar Charge Controller. Deep cycle 12-volt batteries will store and provide the power generated from the solar panels. Installation time is minimal thanks to plug and play connections and included flat mounting hardware. Monocrystalline is the most efficient type of solar cell available on the market letting you get the most power per square inch. More durable than amorphous type solar panels the Nature Power Monocrystalline Solar Panels are warrantied to retain at least 80-percent efficiency up to 25 years. 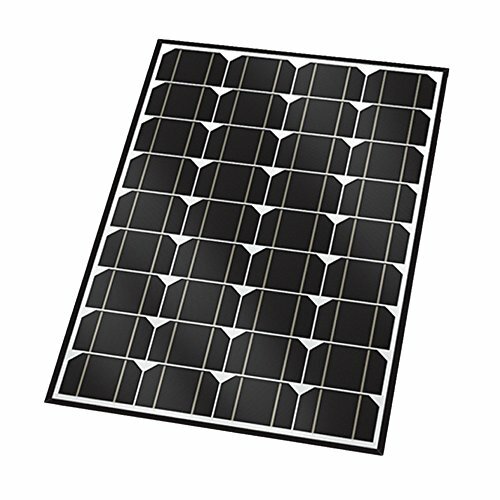 Each Nature Power Monocrystalline Solar Panel features a blocking diode and a bypass built within the wiring protects your batteries draining due to reverse current and power loss due to shade. Solar panels operate silently and without fuel or fumes. An optional tilt mounting system is available separately. Actual product measures 26.4-inch by 27.6-inch by 1.6-inch and weights 16-pound. If you have any questions about this product by Nature Power, contact us by completing and submitting the form below. If you are looking for a specif part number, please include it with your message.